In which I share the Office365 glitch-of-the-day. 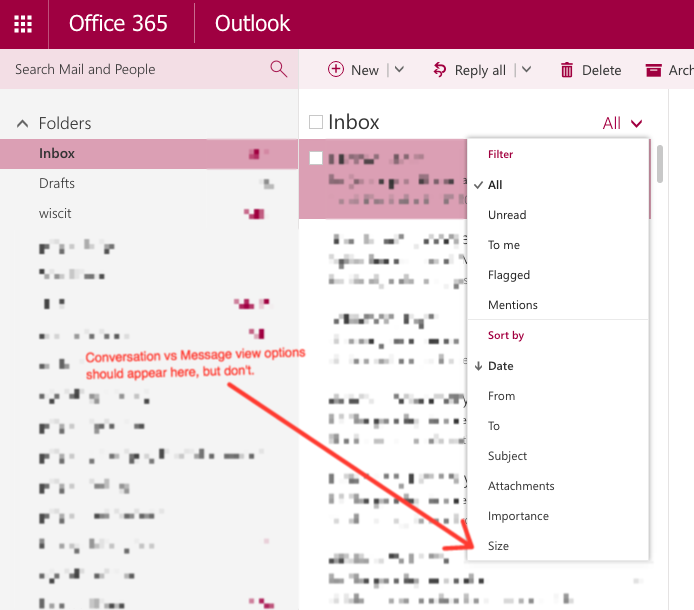 In the course of a technical support call with Microsoft learning about potential workarounds for the goofy user experience upon sending an email to a list, one of the suggestions was to toggle back and forth between Conversations and Messages views to try to get Outlook Web Application to refresh the state of the thread. Switched to Messages view via Inbox --> All --> View as --> Messages (switching from checked Conversations). Attempted to switch back via Inbox --> All --> View as... but wait! No "View as" pull down menu item section appears. (Screenshot). In 4, the All pull down should have still had the View as menu section, now with Messages checked, so that I could again select Conversations mode. The pull down menu refreshed so that it included the View as sub-section. Unclear whether this was a time elapsed or clicking-around fix.